Kay played college basketball in the United States for the Metropolitan State University of Denver from 2011-2015 alongside future Boomers team mate Mitch McCarron and helped the Roadrunners to four consecutive NCAA tournaments as well as a Runners-Up finish in 2013. He was twice named first-team All-RMAC and in 2014 was awarded the Most Valuable Player of the RMAC Tournament. Following the end of his college career, Kay returned to Australia to play for the Townsville Crocodiles in the NBL and he averaged 10.8 points and 6.7 rebounds in his debut season to be named Rookie of the Year. He then made the move to Illawarra where he currently resides while also spending time in the NZNBL with the Southland Sharks. Making his mark on the national scene, Kay was an important member of the FIBA Asia Cup gold medal as the Boomers advanced undefeated through the tournament, finishing with averages of 7.2 points, 3.8 rebounds and 2.2 assists per game. After two seasons with the Illawarra Hawks, Kay signed a three year deal with the Perth Wildcats in time for the 2018-19 NBL season. During his first season with the Wildcats Brandt averaged 15.2 points and 8.6 rebounds per game as he made the All NBL First-Team for the first time in his career. 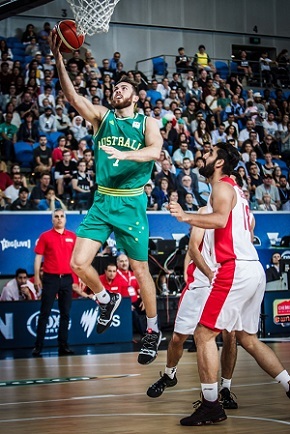 Kay was one of four players to play the most FIBA World Cup Qualifiers for the Boomers with 10 games, as Kay averaged 8.4 points and 4.9 rebounds per game, helping the Boomers qualify atop Group F for the 2019 World Cup in China. In March 2019, Kay claimed his first NBL Championship as a member of the Perth Wildcats, as the 'Cats' defeated Melbourne United in four games. Kay was instrumental in the series win, averaging 10 points, 7.3 rebounds, 3.3 assists, 1.8 steals and one block per game in the Grand Final series.